As if you don’t have enough reasons to love skiing, here's another: Ours is the only sport whose name combines with a French prefix to form a new term meaning "party after the sport." Don't overthink this: We're talking, of course, about aprés ski. In spring, aprés ski goes outside, enabling you to catch a tan along with a buzz. Good times. Better yet, the sun shines so brightly at altitude in spring people can finally peel off layers, proving for the first time all winter they are sexualized human beings instead of Primaloft-clad puffballs. After a day of hero turns on ever-forgiving corn, top your day at these eight all-time aprés ski decks. 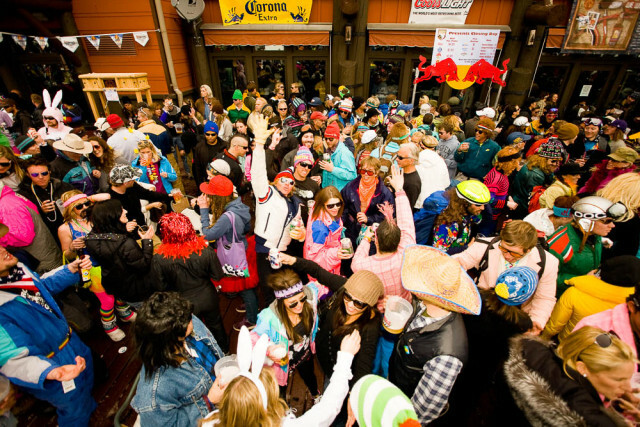 Situated on the Gondola Plaza in the heart of Telluride, Oak is town's only ski-in, ski-out booze emporium. While dogs and kids romp around the adjacent courtyard, skiers settle their tired trunks on deck chairs and sigh with relief. Outside are sunny tables patrolled by waitstaff serving cheap drafts of Schlitz and, befitting Oak's Deep South ownership, a wide selection of fine bourbons. Oak also slings T-ride's best finger food: zesty nachos, sweet potato fries, and deep-fried okra. While Oak usually reverberates with conversation, it hosts a band and raucous party after the season's last day in April. You haven't done Vail till you've sipped a zesty margarita on the deck of Los Amigos. The joint's magical, tart-yet-sweet cocktails come in salt-rimmed goblets befitting an Aztec god. Plus, there's entertainment. Thanks to the miracle of mountain topography, Los Amigos bathes in sunshine while nearby Pepi’s Face gets shadowed and slick. The result: bloodthirsty tipplers cheering the inevitable biffs of tired skiers. Sometimes Los Amigos patrons rank the wipeouts by holding up scorecards. Olé! As the name suggests, there's nothing genteel about the Mangy Moose. Its walls percolate smells of spilled beer, wet dogs, snowboarder B.O., and the weed pipes circulating freely on the porch. Fortunately, the Moose is a warm, two-storied barn of a tavern with plenty of airspace to evaporate stench. Situated slopeside just a short glide downhill of the Jackson Hole Tram, the Moose wins customers with both gravity and its decades-old reputation as an irreverent, boisterous, speaker-rattling Jackson Hole landmark. The Moose milks everything out of the Wyoming sun, just as Jackson Hole milks everything from your quads. Occupying a giant chunk of prime Whistler real estate with a commodious, sun-splashed deck, the GLC combines a terraced interior big enough to host music headliners such as Michael Franti. The bar mixes a mind-blowing Caesar (the vodka and Clamato juice blend considered Canada's national cocktail). A GLC Caesar feels like a meal, adorned as it is with habanero, celery, lemon, and even bacon. Enjoy it just yards (sorry: meters) from the slopes, where skiers and snowboarders backflip off a fat kicker. The passion for skiing—and especially ski racing—emanated by this pub shows even in its address: 205 Picabo Street. Located at the base of Mount Baldy in the Warm Springs base area, Apple's has poured brewskis and grilled all-natural burgers for après ski forever…long before the street outside was renamed for local girl/Olympic Medalist Picabo. Sit beneath vintage posters of gate bashers and relish Apple's unmatched collection of World Cup memorabilia. The outdoor patio is where skiers kick back and watch their compadres rip down Warm Springs while sniffing the hot springs' sulfur. It's amazing that in development-crazed California, virtually no bar, pub, or social club rose to challenge the Loft for après business till the turn of the century, when Squaw Valley replaced a vast parking lot with a thriving pedestrian village of shops and restaurants. By then, this festive tavern enjoyed a 30 year head start, evidenced by the Loft's old school character, cheap pitchers, and sweet memorabilia. There are worse things in life than to sit on the deck chairs abutting Loft's lovely courtyard and scope young Californians. With a name as French as "aprés ski", Le Shack thumps with music and energy. This is where hip Montrealers gather to trade stories and clink glasses while saying "sante." The drink menu has everything you could possibly imbibe, often with something maple involved. Rumor has it that ecstatic skiers buzzed on accomplishment, sunshine, and booze have offered "Voulez vous couchez avec moi?" once or twice at the shack. Just a snowball’s throw away from the Aspen Mountain gondola is one of skiing's all-time great parties, the 39 Degrees Lounge, whose outside deck contains not just tables and chairs but a DJ, a swimming pool and jacuzzi (well, they sort of belong to the Sky Hotel, in which 39 Degrees resides). To conceptualize how drinks, cocktail waitresses, sunbathers, and swimmers go together, think of a Las Vegas pool scene like that at the Hard Rock Hotel—add goggle-tanned skiers and you’re there.